Today we continue our ongoing look at Brewer News, the club newsletter published throughout the year to keep fans appraised of the latest news and upcoming events. This is Volume 3 Number 5, from September 1945, covering the last seven games of the season. 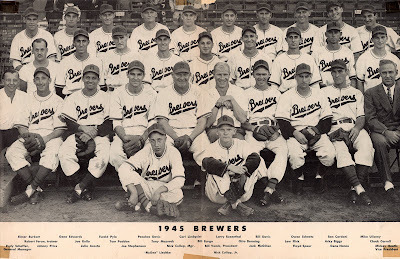 The Brewers were "roaring down the home stretch toward their third straight pennant", and team president Bill Veeck was recovering from a fourth operation on his right foot, injured while he was in the Marines. 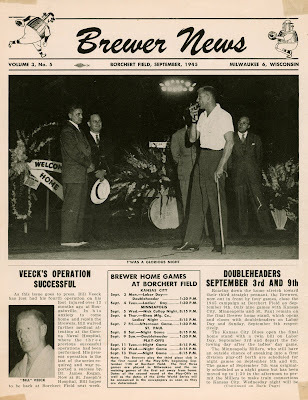 Veeck's return gets top billing, with a plug for the remaining home games. The team was also gearing up for the American Association's playoffs and looking ahead to the Little World Series. This photo was prized, as evidenced by the tape marks around the edge. I picture this hanging on the wall of some kid's bedroom in Milwaukee in the early Autumn days of 1945. 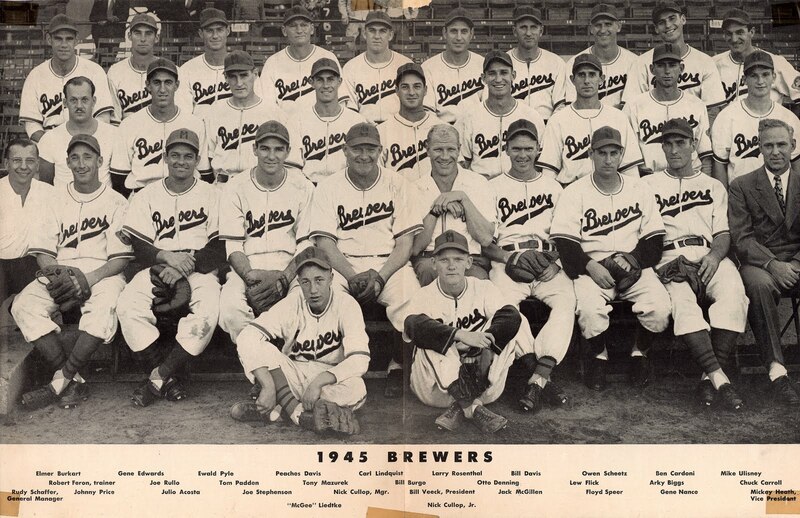 This beautiful uniform style was first introduced to the Brews by Veeck in 1942. The elegant script helps visually define his era at the helm. The photo itself must have been taken just before publication; Veeck sits right in the center, cane in hand. Other notable figures pictured are team skipper Nick Cullop (immediately to Veeck's right), general manager Rudy Schaffer and vice president/radio voice Mickey Heath. I also love the two batboys. On the right is Nick Cullop, Jr., who would be instantly recognizable as the skipper's son even if he didn't share a name. The batboy on the left is identified as "McGee" Liedtke. I don't know what the nickname means—his real name was Clyde E. Liedtke—but I bet it's a very good story. The real meat comes on the back page; lots of good stuff here including a fine photo of the Brewers' slugging left-fielder laying down "a perfect bunt." "FLICK HEADED FOR BATTING CROWN" – Lew Flick was about to wrap up a spectacular offensive season. At the time this issue went to press, Flick's average was .372 and well above his Association competition. I think it's interesting that Veeck's Brewers made a specialty of slugging, taking home batting titles every year of his ownership to date. In 1941 it was Leo Novikoff, 1942 Heinz Becker, 1943 Grey Clarke and George Binks in 1944. "ANNUAL PLAY-OFFS COME NEXT" – As the pennant winner, the Brewers were scheduled to face the third-place club in the playoffs. The second- and fourth-place finishers would square off, and then the winners of those two series would face each other in the second round to determine which team would represent the American Association in the Little World Series. This arrangement, known as a "Shaughnessy playoff", was one of the banes of Veeck's tenure in Milwaukee. No matter how strong his clubs, even the pennant-winning ones couldn't get out of the playoffs, and he lobbied unsuccessfully to change the postseason format every year. "NICK CULLOP NIGHT SEPTEMBER 5TH" – The Brewers had a special fondness for honoring players and managers with nights of their own. I wonder how Nick Cullop felt about being referred to as "tomato faced." For that matter, I wonder how Nick Cullop, Jr. felt about it. Brewer News continues to give us a great look at the way the club presented itself to its fans at the time. The hindsight of history lets us fill in the blanks; Lew Flick continued his slugging prowess in those last seven games, ending the season with a batting average of .374 and the Association crown. The end of the year wasn't so happy for the Brewer organization. They did indeed claim the 1945 American Association pennant, but were ousted in the first round of the playoffs by the Louisville Cardinals. Veeck's playoff struggles continued; the Brewers wouldn't win a Little World Series until 1947, after he had sold his interest in the team. Veeck's operation was ultimately unsuccessful, and after a series of additional operations, his right foot was amputated in 1946. Three months after that, in true Sport Shirt Bill fashion, Veeck threw a party to celebrate the delivery of his first prosthesis. A dance, of course. 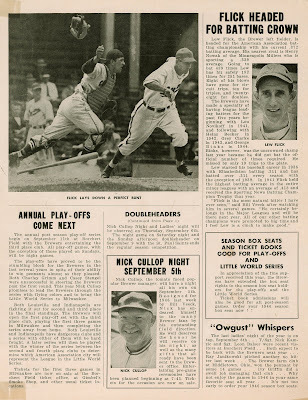 And so, mere weeks after this issue of Brewer News was distributed, the 1945 season came to an end. Perhaps this copy remained taped to that bedroom wall throughout the winter, as thousands of Milwaukee fans looked forward to 1946.